The James River plantations are a great way to get a taste of early life in Colonial America (for both the rich and slaves alike) without the crowds of Colonial Williamsburg, Jamestown or Yorktown. A tour of these elaborate, historic mansions -- such as Shirley, Westover, Berkeley, Edgewood, and Tuckahoe -- is the perfect addition to your Virginia Beach family vacation getaway. It's a great way to have family fun and learn something about Colonial America too! And since it's just a short drive from Jamestown, Yorktown, Colonial Williamsburg, and Busch Gardens Williamsburg, it can easily become part of a Colonial Williamsburg family vacation getaway. Just an hour or so from Virginia Beach, you'll drive up (or down) Highway 5-- a long, windy drive down a lovely, lonely stretch of road. You'll see remnants of Virginia's colonial and Civil War past by touring massive estates still open to the public. Our favorite photo op at Shirley Plantation, perhaps the most famous of the James River Plantations. These huge old estates--called the James River Plantations because they overlook the James River--include Shirley, Berkeley, Westover, Evelynton, Edgewood, Piney Grove, Carter's Grove, and Sherwood Forest. Our family favorite is definitely Shirley, so I've written a detailed review below (including what you can see for free! Here's an overview of all the plantations, including admission facts and hours. But beware: The road the James River Plantations are located on is pretty (especially during the fall foliage season), but lonely and remote--not close enough to pop by Colonial Williamsburg for gas or something to eat. So plan ahead and gas up ahead of time so you can go from mansion to mansion. River Plantation? You can! If you'd like to do more than just tour the mansions, here are three plantations that operate as bed and breakfast inns. Look! 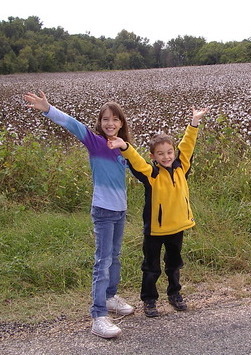 Real cotton fields outside Shirley Plantation! Snow covered fields in September? Nope...cotton! Fields and fields of it. It was the perfect backdrop to the long drive up to Shirley. We could picture hundreds of pre-Civil War slaves toiling away in the fields, sun blazing, from dawn to dusk. (In fact, in 1787 Shirley's then-owner, Charles Carter, owned 785 slaves in 8 counties... including 134 at Shirley). One of the things we like about Shirley is how it reveals itself. As you come through a clump of trees, you see it...there, off in the distance, like a grand old lady waiting for YOU to approach and pay your respects. The Shirley tour...and what's a dovecote? The dovecote at Shirley Plantation. 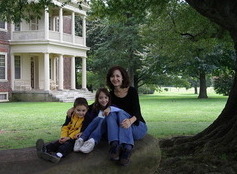 The thing our kids liked best about Shirley Plantation isn't even in the house. It's the outbuildings! Like frozen specimens of Colonial America. Eight of 'em, to be exact. There's a dovecote (What's a dovecote? Keep reading), a granary/ ice house, a tool barn, a stable, a root cellar, a kitchen, and a laundry...plus plenty of wide open garden areas for strolling or getting the wiggles out. Pulling into the parking lot, the kids immediately noticed a round, turret-like building with little nooks in the walls. Turns out this was a dovecote, so doves could build nests...and lay lots of eggs...and make lots of little doves...to provide tasty dinners for the owners! All of the buildings (except the root cellar) are open and have brief explanations of what they were used for during the Colonial era and the Civil War, as well as a few artifacts. 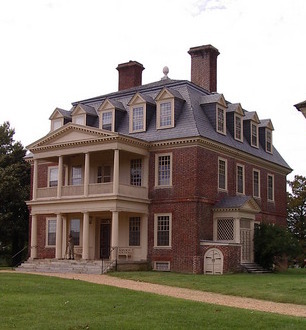 Shirley Plantation, the house many consider to be the "best" James River Plantation. Shirley sets itself apart from the other James River Plantations by calling itself "Virginia's First Plantation." 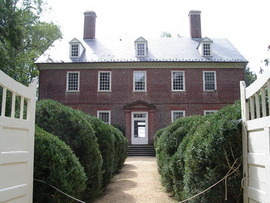 Although the house itself wasn't built until 1723, the first plantation started there in 1613. Shirley has been the home of the Hill-Carter family for 12 generations. In fact, the house tour revolves around this family connection with enough family history to make one giddy (don't know how the docent keeps it straight). one Carter had 23 kids over two wives; one cousin was no other than a VERY famous civil war general. the good-for-nothing uncle who had control of the house while his owner-nephew was a minor...and who sold the lead right off the roof to make a quick buck by selling it for bullets during the war. Revolutionary and Civil War buffs will love this! Enjoy a glimpse into Virginia's exciting Colonial and Civil War past? Looking for a way to get some family fun and a little history into your child (or a lot, depending on your child's age and attention-span)? Then a visit to the James River Plantations--and in particular, Shirley-- is well worth your while. Yes, younger kids may find the house tour a little slow, but the tour isn't too long. Besides, being able to explore the outbuildings and run through the gardens more than makes up for it. And you won't have to worry about dealing with the crowds (or traffic) at Colonial Williamsburg! Admission: Adults - $11.00, Seniors - $10.00, Youth (6-18) - $7.50, Under 6 - Free. Active duty Military and veterans get in for only $5! There is also a AAA discount with ID. If you want to experience at least part of Shirley for free, skip the house tour. You only have to pay for the house tour, while access to the outbuildings (the dovecote, smokehouse, kitchen house, etc.) 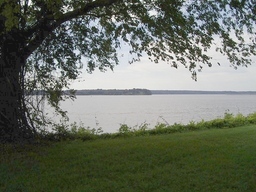 is free...as is full access to the beautiful grounds which have a magnificent panorama view of the James River. So pack a lunch, stroll the grounds, breathe in the feel of the place, take a leisurely ride down Highway 5, and you can make an afteroon of it...and only pay for the gas! Veterans can visit for free on Veteran's Day. Homeschoolers can get discounted admission during Homeschool Days, generally the third weekend in September. Check the website's Calendar of Events for details. On a recent visit to nearby Berkeley Plantation (also worth a visit! ), we were pleased to find a memorable tplace to each lunch. Upper Shirley Vineyards is a formal polo club which offers wine tasting, lunch, and small plate desserts. Find my full review of Upper Shirley Vineyards and Berkeley Plantation here.